To understand Egyptian mummies you have to first know about their religious beliefs. Ancient Egyptians believed in many gods and that when a person died they passed into an ‘afterlife’. The thought that the individual would have a life that was very close to the one that they lived in with everyone else. In order to have that kind of life, their body needed to be preserved and they needed to be buried with all of the possessions that they would take with them on their journey into the afterlife. Ancient Egypt had a successful society that lasted over 3,000 years. 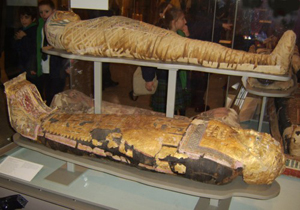 The priests of ancient Egypt developed ways to preserve or ‘mummify’ a body so that it would last. They mummified people as well as animals and archeologists have found entire burial chambers just devoted to the burial of mummified cats. While other animals were found, cats were the favorite and most loved pet of the ancient Egyptians. 1} The body must be purified and washed. 2} All internal organs were removed, however, they left the heart in place. 3} They filled in the body with a kind of stuffing so that it would look normal. 4} They had to ‘dry’ the body out, so they placed it in a naturally found substance called ‘natron’. This was almost like salt and it drew out all of the moisture in the body. 5} In about 40-50 days, they removed the body from natron and then replaced the original stuffing with new stuffing made out of sawdust or linen. The organs of the body that had been taken out were also mummified and placed in special containers that would be placed in the burial tomb with the body. Both the sarcophagus and the jars containing the body parts were sealed with a black resin. They left the heart in the body as they thought this was required for part of the test needed to enter the afterlife. The believed the heart was the center of all intelligence and emotion, but they removed the brain, thinking it wasn’t important. Pharaohs had the most expensive mummification of all people. Since the pharaoh was considered a god they included many gems and amulets in between the layers of linen wrapping. They would also use a special sarcophagus for the pharaoh that was carved and painted in his likeness. Some were decorated with gold. Others, had solid gold decorative masks placed on the head and face that looked like the pharaoh. The pharaoh mummies were placed in special burial places along with many of the expensive items that they would take with them in the afterlife. Wealthy people would also have similar high quality mummies. 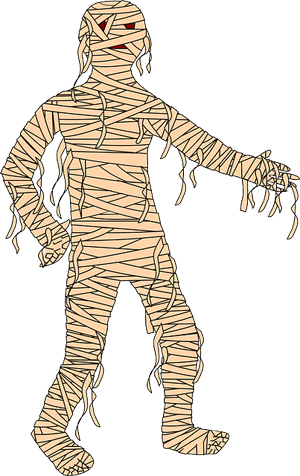 Since it cost a lot of money to create a mummy, they were the only ones that could afford it. Unlike the pharaoh, the burial tombs of the wealthy were usually in group burial grounds. There were special religious burial rites that had to be performed by the temple priests at each step of the mummification. This was done to help make sure that the person who had passed away would enter the afterlife properly. There were special oils that were used that were purified by the priests, but were also developed over the years to help preserve the body. Mummies have been discovered that are over 3,000 years old and when they are uncovered some still have hair and skin.